Well we didn't have time to carve our pumpkins this year.. I know!! Can you hear the utter disappointment in my voice? ( I dislike carving greatly, oh the mess) So we went with a "Mr. Pumpkin Head" theme this year. The kids loved it and to top it off we were done in 5 minutes with no mess & we think they look pretty fabulous!! Then @ 6:00 we went to our Church and attended our annual Trunk or Treat! The kids had fun & I didn't have to make dinner because they served hot dogs & hot cider (thank you very much). The kids played tons of games & scored all kinds of Halloween trinkets and goodies, then we headed outside where they literally were stuffing their bags with candy. Yeah, I know what you're thinking....... Good times! And here we are Trick Or Treating our friends Brent & Maria's house! Sorry had to post one with Brinley wearing her cat mask! All in all it was a pretty good night, granted I was sporting a nice headache and I was stressed to the max (try 2 day's o' stress). We had Addison's B-day party the next day so I have yet another Addison post coming. I know, I know I promise it will be the last for a while, but I promise the pictures turned out pretty cool so of course I have to share. Okay I'm going to drag my sorry, exhausted, stressed out body to bed. Good grief I just noticed it's only 11:40 someone just call me Grandma and get it over with. I mean I usually stay up till 2 am sheesh, see what stress will do to ya. Night all! I LOVE your Mr. Pumpkin heads. Adorable. You have a great family. That is the best idea for pumpkin decorating..just love it!!! Such cute kids and what a fun time! Your kids look so CUTE! Love the pictures! Oh, and little tu tu is absolutely precious!! Halloween is just exhausting anyway and with 5 kids and a birthday I can't imagine! The pumpkin heads are adorable. I may store that idea in the back of my brain for next year. The kids look great and I bet your glad it's over. Hopefully you can sit back and relax a little today. Aww...your kids looked great and love the pumpkins! I'm doin' that next year! Great costumes!!! Forget pumpkin carving...we didn't even make it to the pumpkin patch this year :0( I felt so bad, but the kids assured me they were really ok with it. Maybe next year! how cute are your kids and your pumpkins are FABULOUS! LOVE the mr potato head idea. Holy cow those are soooo cute! You're tired b/c of the time change my dear. Try peppermint oil for that headache. Just rub it across your temples and forehead and voila, gone! Your kids are so cute as usual. And quit apologizing for posting things! That's what i come for! Silly goose. Pumpkin heads is SUCH a good idea! And I love all of the kids costumes!! So cute! I like the pumpkins better that way and I feel the same way about carving and the mess. It's dreadful! 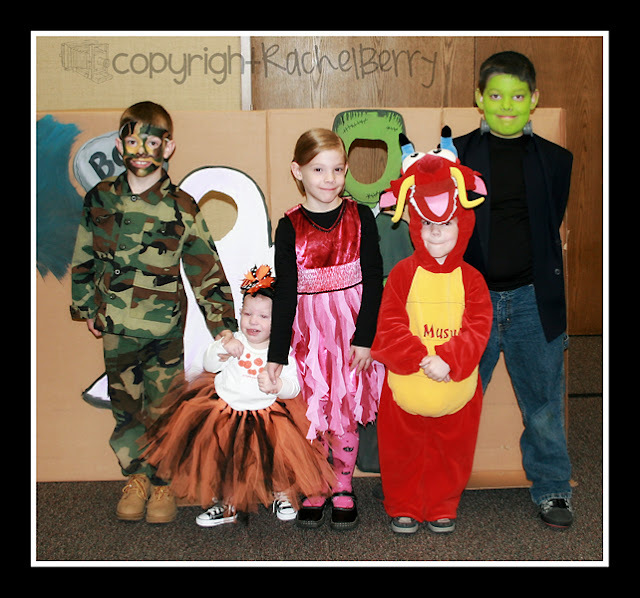 The kids costumes are so great! I'm glad I'm not the only who didn't carve pumpkins this year. Your pumpkins and kids look adorable! Where did you get all the pieces for the pumpkins? I guess because I don't have any little kids in my life I'm behind the times. 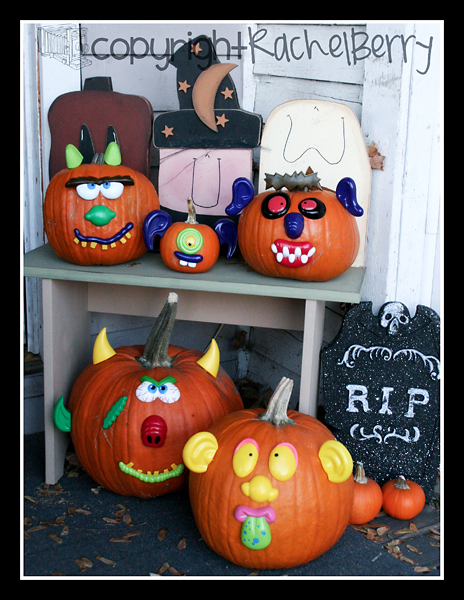 I didn't know there was such a thing as Mr. Pumpkin heads...but what a brilliant idea...and so much cuter that just carving the dang things! Love the costumes...and you need a nice long nap! As you know, I read your blog everyday and enjoy every minute of it. You have such wonderful craft idea's and they are usually very simple. Looks like you guys had a lot of fun for Halloween. As asked above, where did you get those cute pumpkin pieces? Wishful thinking that I can get any up in Canada, but I thought I would ask anyways. I came over from Kacey's site. Congrats on your award and I do love your site! What a great blog and such a nice family! Hope you'll visit my place sometime soon! Your childre are beautiful in their costumes! It sounds like a fun night you all had. I so want another child, so bad! My husband is not ready yet but he better get ready. I'm showing him this blog. Thanks for stopping by my blog. I will check back to see those cute birthday pictures of Addison. gorgeous - did you make the baby's costume?? LOVING the potato head pumpkins. They are PERFECT and so much fun!!! 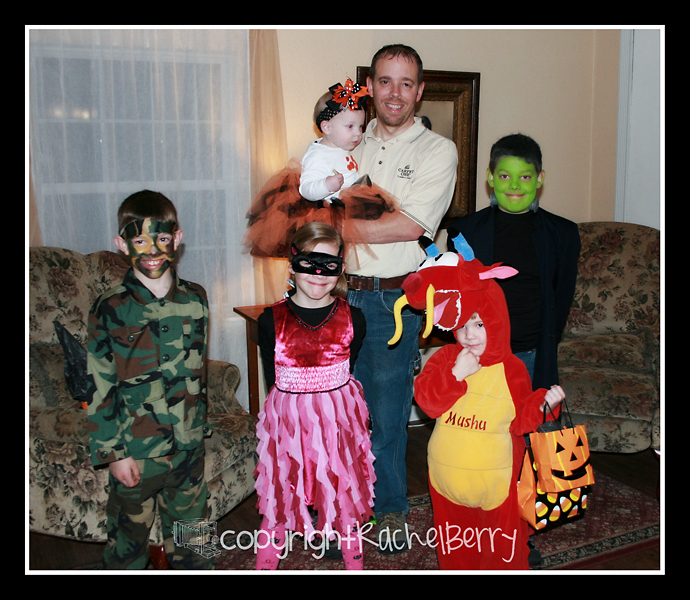 I love all of their costumes, you seriously have the cutest kids.